Home/Technology/Internet/How to record audio from skype? Skype is the top free VoIP and texting messenger. Its main capabilities target at delivering great performance when talking to someone who can be in the other part of the world. Yet, Skype does not provide the functionality to record video calls or VoIP calls. To make that possible, cast glance at the most popular applications, namely MP3 Skype Recorder and Pamela for Skype. By the way, to ensure the best quality of your records, you need to ensure the best Internet connection. Check here to learn how to speed up the Internet connection. MP3 Skype Recorder is an absolutely free-to-use application without limitations on the length of the call. Files are saved in the MP3 format, plus, the app allows you to set up the quality of the output file. 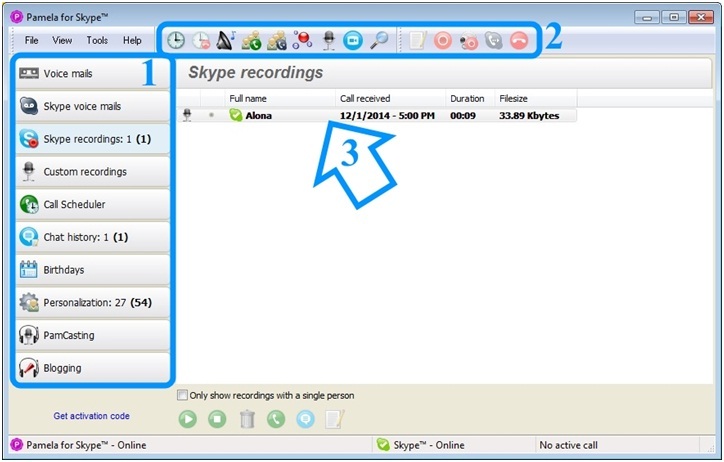 MP3 Skype Recorder integrates with Skype Conference recording and is capable to follow several calls at the same time. 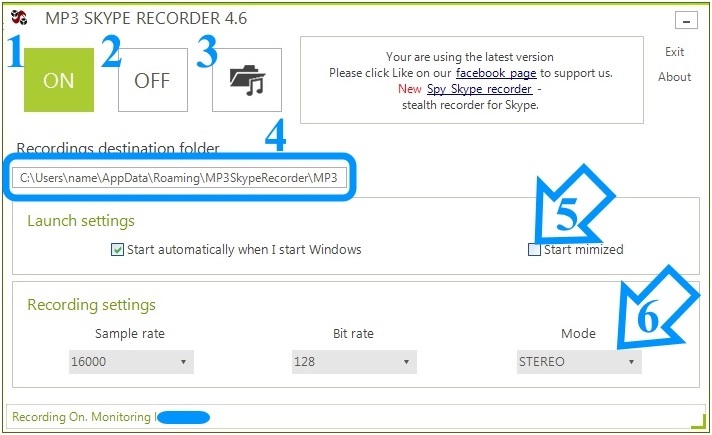 To add more, you are able to make MP3 Skype Recorder launch automatically on Startup. As it is presented in the next screenshot, MP3 Skype Recorder has a straightforward interface. Use the mode ON (1) to let the app monitor your Skype activity. Once you call, MP3 Skype Recorder shows the pop-up message that recording starts. If you switch off this app by clicking on the button OFF (2), you will not be able to record and save the call. Button 3 leads you to the folder with all recordings. In order to change this folder, click in the area 4 (in the box where the file path is shown) and select in the appeared window the necessary folder. In the area 5, check the boxes if you want to launch MP3 Skype Recorder on Windows Startup. In the area 6, change the quality for your recordings. Overall, when you want to record unlimited calls, download and use MP3 Skype Recorder. If you are interested in extended functionality, read below about the advanced app called Pamela. Pamelafor Skypeis another great solution, which works perfectly when you need to save all your voice mails and Skype voice mails, create recordings and save chat history. Moreover, Pamela helps you schedule your calls, check birthdays of your contacts and launch conversation on Skype. On top of that, Pamela is available for 30-days trial, so you will have plenty of time to explore all its functionality. Check the next screenshot. Pamela concentrates all the necessary tabs on the left, while on the top you find the pop-up menus and some settings. On the left (area 1), every tab leads to the list of your chats, contacts, recorded calls, scheduler, etc. It is easy to navigate and to find necessary information. On the top (area 2), you can find several buttons that enhance your experience while you use Pamela for Skype. These buttons open settings to create timetables of calls, organize groups, and search calls by notes, andrecord messages for your blog. In the biggest area (3), you will see the list of recordings. You cannot only record actual conversation or video conference, but you can also save custom video and audio recordings. As you see, these two applications are great at what they do. With MP3 Skype Recorder, you are not limited in any regard: record a call of any length at any time. Pamela for Skype provides much better functionality. Although, if you want to have it for a longer period than for 30 days only, you will have to pay. Try Pamela for free time to understand, if this functionality is worth paying. If not, download completely freeMP3 Skype Recorder and be happy with it! Both apps are secure, although you can read here how to protect your communication better. The last but not the least, followthe website JoyDownload, where you can find both applications and download them free of charge.